I am working hard (or hardly working) on our master bathroom vanity! I spent the whole day in the garage on Monday, but it was such a mess from all the other projects I have been working on, so I spent the day cleaning and organizing instead of building. Now I have a place to build the vanity and this coming week there is nothing going on so I will also have time. I can almost smell the progress! 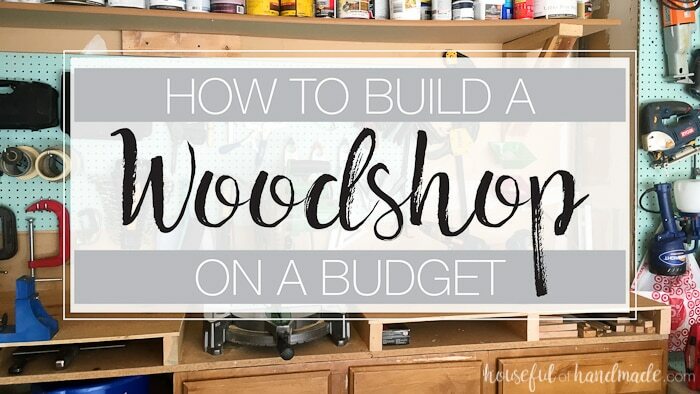 If you are looking to start your own woodshop, or just add to it, I thought I would share with you my favorite budget friendly tools. This post contains some affiliate links for your convenience. Click here to read my full disclosure policy. Thank you Jamie! I love having a defined space. This is great! Thanks for sharing at Merry Monday! Just what I need! I am trying to get organized and find a dedicated space. This is perfect! Thanks Michelle. Having a dedicated space is great, unfortunately I have to share mine with the cars, but it works. 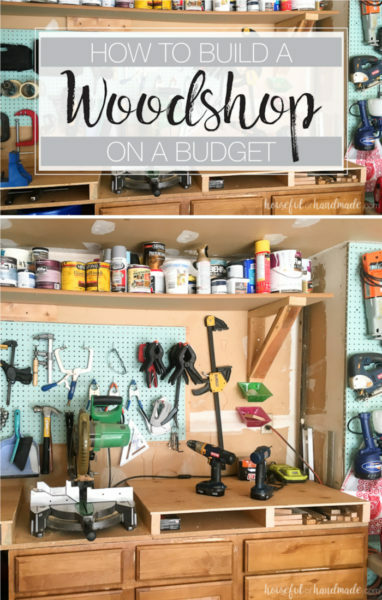 This is perfect for me, I have all these tools for Ryobi and I am very anxious to get my work shop organized.